Découvrez Cove phare de Peggy, le fracas des vagues et des couchers de soleil spectaculaires. Cette maison de deux chambres avec salles de bains 1. 5 est la maison la plus proche de Cove Peggy. Vue panoramique depuis le look de salon ouest sur Saint- Superbes couchers de soleil de la baie de Marguerite. 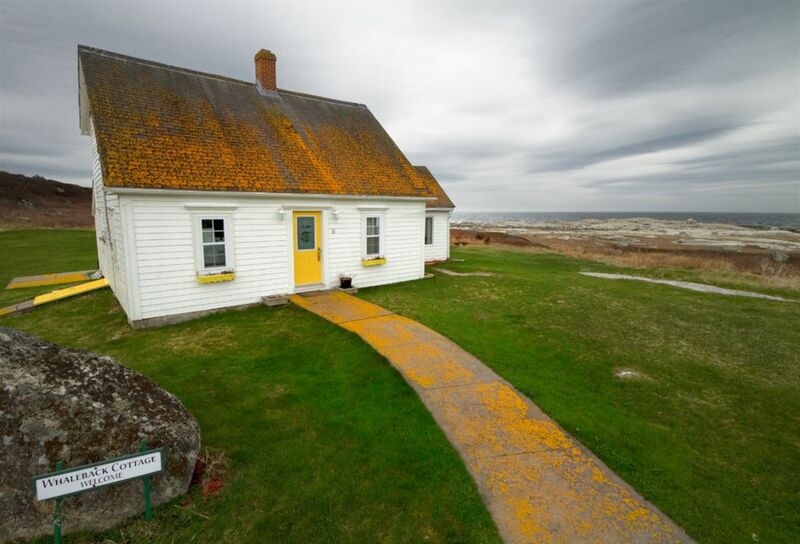 Tout ce qui sépare cette maison du crique de Peggy est la belle Cove Preservation Area Peggy, Un amoureux de la nature paradis. De cette maison, vous pouvez marcher le long de la côte à Cove Peggy. A quelques minutes de marche dans l'autre sens, vous pouvez acheter du homard frais de Lobster Pound Ryer, ou dîner au restaurant à la rhubarbe. Le summum de la vie privée et de vues, un endroit fantastique pour une retraite ou un mariage. Complète à l'étage de la salle de bain avec une salle d'eau à l'étage principal. Situé à quelques minutes à pied des galeries, un magasin général et du homard frais de Lobster Pound Ryer. We loved Whaleback Cottage! It was very comfortable and clean with incredible views! Tom and Donna were great hosts! We would definitely stay there again. Beautiful location beyond compare. We did not want to leave after seeing the view from every window. The sun room with 3 picture windows and day beds held us in its spell. Whether sunny or during a storm the rocks and waves are mesmerizing. Famous Peggys Cove lighthouse can be seen from the cottage- and you can see the cottage from the lighthouse. Add to this the most gracious owners we have ever experienced. Tom & Donna went above and beyond to assure we had everything and were full of tips and facts on the surrounding area. There should be more than 5 Stars for a property like Whaleback Cottage. I can only repeat what most of the other reviewers have said. Amazing views of the ocean, cozy cottage by the sea, wonderfully attentive host (thanks Tom! ), sunrises out one windows, sunsets out the other. My wife, her sister and I enjoyed a spiritual retreat in this wonderful gem. We used the well stocked kitchen for breakfast and lunch and then ate a variety of restaurants that Tom recommended for our evening meal - no disappointments! We had two sunny days and two stormy days - both types were delightful. In some ways, the stormy days were better as we read and talked in the little living room while watching the waves crash high in the air above the rocks. We are all "senior citizens" so we didn't hike much but did enjoy the easy walk on the rocks in front of the cottage. We did venture out to Lunenburg and Mahone Bay to do the touristy things but quite honestly, we didn't want to leave the cottage! We can't recommend Whalesback Cottage highly enough and hope to return for future visits. The cottage is picturesque and well appointed. Views of ocean and Peggy's Cove. Extremely quiet with just the sound of waves at night. Walking distance to Peggy's Cove lighthouse. A perfect way to spend the week or a few days in Peggy’s Cove!!! We spent 4 wonderful days here and would recommend it to anyone. Just what you need to unplug and recharge from life. The cottage is well appointed and in one of the most captivating settings in the area; a private drive just a walk away from The Swissair 111 monument. Thomas and Donna are just wonderful hosts full of ideas and great suggestions. They made our stay worth the long drive from CT. I look forward to coming back again real soon. This house was an excellent gateway he ocean. The rocks along the shoreline are easy to walk along, and beautiful to watch the sunset from. It does smell a bit musty, but that was fixed by opening all of the windows, and we were not surprised about this as it is so close to the ocean. It was very private. Excellent and would recommend!